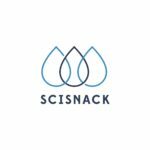 To celebrate both the Christmas period and the variety of nationalities within the UEA ClimateSnack group we have put together this group post. In the UK it is often said that as a nation we are obsessed with the weather, here we demonstrate that many countries have idioms relating to the local meteorological conditions. This post is a slightly humorous, often scientific, glimpse into these idioms. 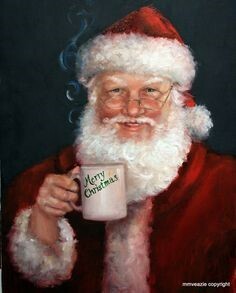 Wherever in the world you are reading this, Merry Christmas, enjoy the holidays and hopefully we will all see some interesting weather phenomena (let it snow, let it snow, let it snow). “Rosso di sera bel tempo si spera” they say in Italy, “if it is red at night, you can hope for good weather”. Despite being an Italian saying, the “red’ mentioned here is not a good wine or even a mulled wine. 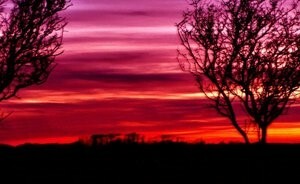 Instead it refers to the colour of the sky at sunset. The idiom is well known across the whole country and seems to be related to cyclones which hit the country. The Alps are a good barrier to bad weather from the north, similarly the Balkan Mountains block cold air spreading from Eastern Europe. Atlantic storms from the west are however quite free to reach Italy. The west is also the direction in which the sun sets every day. So, what’s the link? When the sun is setting, the light colour changes due to the angle of the sun. At sunset, rays have to travel a longer distance through the atmosphere and the blue (high frequency) waves are scattered away. Red (low frequency) electromagnetic waves are scattered less by atmospheric particles and when the sun is low on the horizon they are predominant in light. Low frequency red light is absorbed by water molecules and so atmospheric humidity affects how red the sky appears. If the sunset is well coloured, it means that in the west there is low humidity, not many clouds and no large cyclones. If there are no perturbations in the direction from which they usually come, there is a better chance of the weather being good. The rhyme also has a second part, “rosso di mattina, il brutto tempo si avvicina” meaning “red in the morning, bad weather is coming”. The explanation is almost the same. In the morning the sun is low on the horizon, if there is no humidity, the sky turns red. But this time, red (aka the nice weather) is on the ‘wrong’ side. Therefore the bad weather must be towards west, where it comes from, and hence travelling towards Italy. ‘Red sky at night…’ is in fact a rule of thumb in all those regions where the predominant wind direction is westerly, as in the mid-latitudes, where Italy lies. These two cloud features form the basis of an old nautical sailing proverbs. Mare’s tails are cirrus uncinus clouds – these are high altitude, upper troposphere clouds, mainly formed by ice crystals. Their fluffy, soft and elongated shape (hence Mare’s tails) indicates strong winds at high altitude – a sign of an approaching weather front. 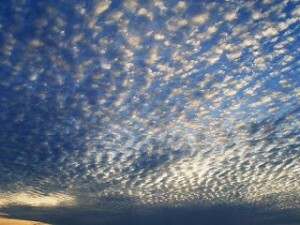 Mackerel Scales represent a sky almost full of mid-level altocumulus clouds. 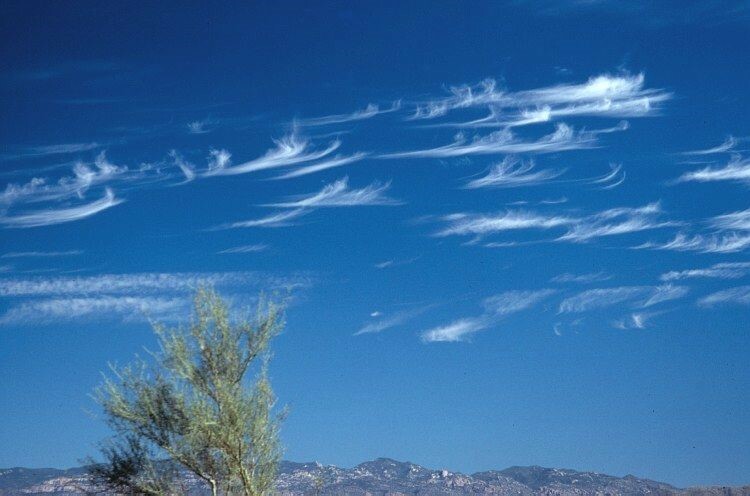 These are a sign of atmospheric instability and high moisture at an altitude which is responsible for a large amount of precipitation, but the implication for weather is not as one sided as the presence of Mare’s Tails. These clouds could well be the remnants of a dying weather system which has rained out – altostratus turned altocumulus, or indeed these fishy formations could signal the onset of a weather front and associated showers. “Mackerel scales and mare’s tails, make lofty/tall ships carry low sails.” – In this case, mare’s tails and Mackerel scales show up together to describe the coming weather front and high winds – a warning sign to the ship’s captain. Time to lower your sails! “Mackerel in the sky, three days dry” and “Mackerel sky, mackerel sky. Never long wet and never long dry” refer to the dry side of the Mackerel. In the first instance, the altocumulus filled sky marks the passing of a beaten-down weather system which usually isn’t followed by another rain-bearing front for a couple of days. In the latter, the Mackerel seems to not be completely dead and is wiggling around, making the spectator wet on occasion. The geographical position of t he Netherlands and its near constant battle to remain above sea level has led to a large number of idioms relating to both water and wind. 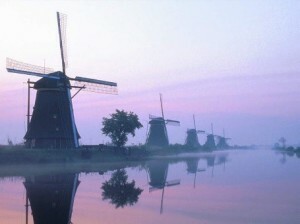 To the Dutch “bringing water to the sea” is like carrying coal to Newcastle, a useless exercise. A plan that “falls in the water” doesn’t work out. A good business man “makes money like water”, consequently he “is as rich as the water is deep”. If the “water is at your lips” you’re in deep trouble; when you’re “living like a fish in water” you lead a happy and satisfactory life. Someone “between water and wind” has difficulty choosing between two options. When you “take the wind out of the sails” you put someone at a disadvantage, if you “get the wind from upfront” someone is telling you off. When disregarding advice you “put it in the wind”. “Fighting windmills” means you’re fighting an unreal danger. Finally, the logarithmic wind profile tells us “tall trees catch a lot of wind”, people in high ranks can expect more criticism. In Normandy, France, there are many cows and very strong winds. Unsurprisingly, there is a saying linking them – “A wind to de-horn the cattle”. You would think it means a wind so strong it blows the cattle’s horns away, but that is impossible. At two months old the horns of a calf become part of the skull, to blow them away we would need a wind strong enough to break bones! What this actually refers to is the farmer removing the horns so that cows don’t injure one another. The removing of horns attracts flies and to avoid the calves becoming ill it is best to do this when the wind is too strong for flies. But does such a wind exist? Let’s have a look at our problem. Flies travel with a velocity of approximately 8km/h or 2.22 m s-1 (yep, flies are quick!). If the fly is travelling directly into the wind then it can’t travel towards the calf if the wind blows faster than it. So it won’t land in winds over 2.22m s-1. where C = 0.47 m s-2 and ΔT is the reaction time of a fly. For wind speeds larger than 80km/h (not unusual for Normandy), the reaction time of the fly needs to be smaller than 4.10-4 s to land. That’s nearly 1000 times faster than a human! The above equation suggests that flies can’t manoeuvre when winds are higher than 80km/h – a good wind speed to dehorn your cattle! From the U.K- Raining cats and dogs. 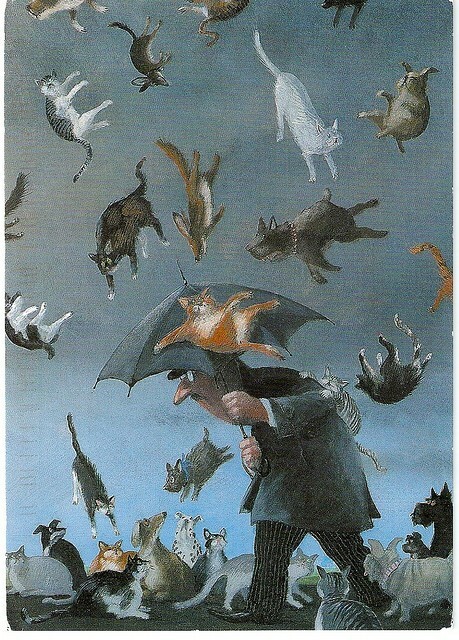 Here in the UK when it rains really hard we say “it’s raining cats and dogs”. This is because of the loud noise of the rain falling on your roof. There are equivalents in other languages, in Czech you might say that flatbed wheelbarrows are falling outside, while in Norway you could say it’s raining female trolls. Rain falls once it gets too heavy for the updrafts in a cloud to keep it in the air. An equivalent statement would be that the vertical wind speed needs to be greater than the terminal velocity of the raindrop. Let us assume that rather than having animal shaped rain, we have spheres of water the same mass as a cat or dog. We can take the weight of a cat to be 4.5kg and a large dog to be 30kg. Using some equations and a calculator we find that the radius of a cat raindrop is 0.1m and for a dog raindrop 0.19m. 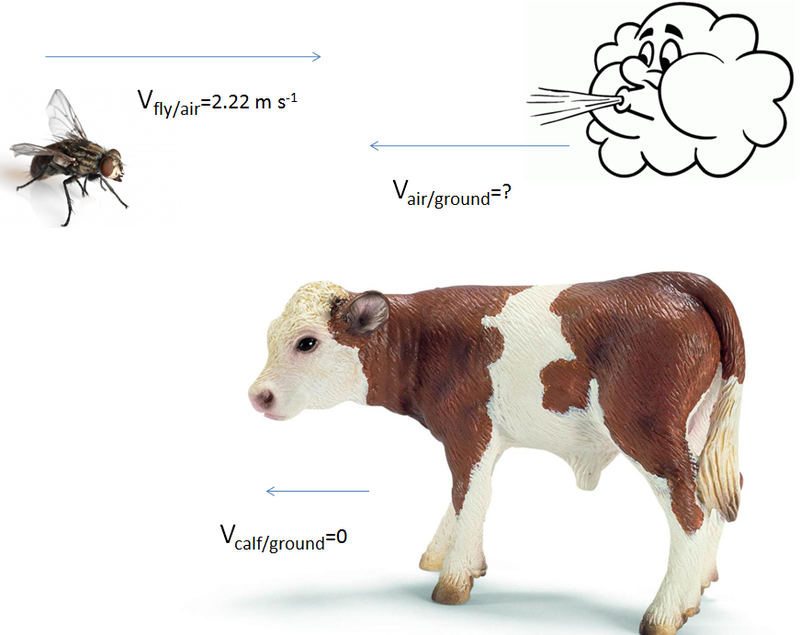 The terminal velocity and thus the speed of the wind required to keep these raindrops in the air is 46.73m s-1­ for a cat raindrop and 88.26m s-1 for a dog. That is 166km/h and 317km/h respectively, some seriously strong wind! 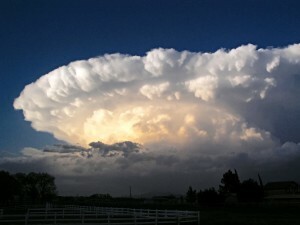 Updrafts over the United States are known to have wind speeds of up to 281km/h! However, we still can’t get raindrops as big as cats though because the force of the wind will break large water droplets! A commonly used idiom to describe someone who is sulking is “to be blacker than a storm cloud”. But how much darker do you have to be to be darker than a storm cloud? And why do clouds darken, preceding rain or snow? Before discussing this, one should recall that a cloud is usually white because the water droplets and ice crystals in it are pretty tiny, but still much larger than a wavelength of visible light. All wavelengths within the visible spectrum are scattered. This occurs uniformly, so all the colours mix equally and we see the net result – white clouds. But the degree of gloominess of a person is compared to a colour of a grey, dark cloud. A cloud turns dark when it grows thicker, reflecting more sunlight back and allowing less sunlight to penetrate through it. As less light reaches the base of the cloud less scattering occurs, and the underside of the cloud appears grey. Moreover, if the water droplets near the cloud base grow larger, they become less effective scatterers and more effective absorbers. As such, for a thick storm cloud, most light is either reflected or absorbed before reaching the cloud base. The depletion of solar beams passing through a cloud can be characterized by the so-called free path of radiation – the distance on which the sunlight becomes e=2.71828 times weaker. Underneath a precipitating cumulonimbus cloud this distance can be 5 to 10 times shorter than an ordinary cloud. This reduces the intensity of sunlight at the base and causes its dark purple to black hue. Finally, cloud brightness is partly due to where you are standing relative to the cloud. If you aren’t underneath the cloud, then the tall and thick cloud is illuminated by sunlight bouncing off it. However if you walk underneath this cloud, it will be much darker. This saying implies terrible winter weather. Could low temperatures and strong wind lead to the situation where you are robbed of the joy of drinking outside in the nice scenery of the Tatra Mountains? In our idealised scenario, we picture a healthy adult person standing in a valley of high mountains and holding a thin shot glass of some tasty beverage. Like every warm object, the glass of drink is losing heat by convective transfer into the air around. It is also emitting infrared radiation, however we assume that incoming radiation from the sky and people around balances the radiation being emitted. We can rule out most of the other effects such as heating due to the conduction of the heat from the human hand holding the glass due to the insulation of gloves. The heat capacity of the thin glass walls shall also be neglected. Let us set air temperature to a nasty -20°C and the wind speed to a harsh 16m s-1. Newton’s law of cooling allows us to estimate the convective heat transfer of the drink. Using the heat capacity and density of water along with our knowledge that we are using a small thin shot glass. We find that if the beverage starts at 7°C the rate of heat loss is 0.034°C/s. This means it would take almost half a minute to cool the drink by 1°C, providing plenty of time to say ”cheers” to companions and bottom up the drink. Though would you really want to be outside in such weather? ClimateSnack UEA is comprised of Amee O'Callaghan Richard Jones, Denis Sergeev, Umberto Binetti, Mike Newland, Ben Webber, Marina Azaneu, Chata Seguro, Rhiannon Davies, Michael Hemming and Peter Sheehan. Tagged idioms, meteorology, Rain, science communication, Weather, Wind.